The video was reportedly shot at night in southern Shabwa Province. It depicts a group of men from the Yemen Army's Second Mountaineer Brigade, said the SITE Intelligence group that tracks online activity of white supremacist and jihadi organizations. Islamic State militants (IS, formerly ISIS) appeared to wield knives and kill four of the soldiers. Their heads are later seen on the ground. The clip then shows 10 other blindfolded and crouching soldiers. They are shot in the forehead, while one is hit from behind. It’s unclear when the video was filmed, but local reports say more than a dozen of the unit’s soldiers were killed in mid-April. Al-Qaeda in the Arabian Peninsula (AQAP) denied responsibility for the executions in mid-April. The atrocity was claimed by "Shabwa Province" militia, which has recently announced itself to be an IS branch. 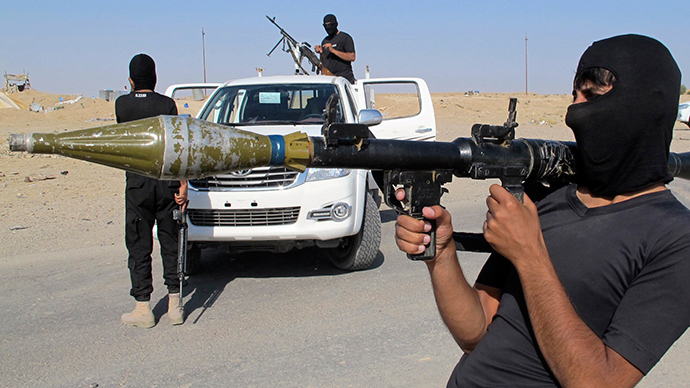 The so-called Islamic State has recently declared its official presence in war-torn Yemen. The jihadists posted a video online, threating to “cut the throats” of Shiite Houthi rebels. The footage showed around two dozen IS fighters in full military gear training in desert terrain claimed to be near the Yemeni capital of Sanaa. "We have come to Yemen, with men hungry for your blood to avenge the Sunnis and take back the land they have occupied," the IS commander said in a video, as cited by the International Business Times. Houthi rebels took control of Sanaa in September 2014, in a move that forced Sunni President Abd-Rabbu Mansour Hadi to flee to Saudi Arabia. They are fighting to control the strategic port city of Aden. Saudi Arabia and its allies have been bombing the Shiite rebels since March 25. According to recent WHO estimates, at least 1,244 people were killed, including 28 women and 56 children, between 19 March and 27 April, while 5,044 were injured.